Risks in Investment and Wealth Management: What are Risks and how to manage Risk? When I was inexperience in all these investing stuff, I had this fear that if I invest a large amount of money tomorrow, and the market goes down by a large amount, it will seriously mess me up. And it did happen during the financial crisis. We find it difficult to sleep soundly at night, because we are afraid that we will lose a large part of the wealth we put into investment. When you are near retirement, that fear is bigger, because if you lose more than 50% of your wealth, you do not have time to make them back. that will jeopardize your financial independence. So financial institutions came up with questionnaires to segment us into categories depending on our tolerance to risks. I find that there is a misunderstanding about what risk is. I think people do not understand risk enough. 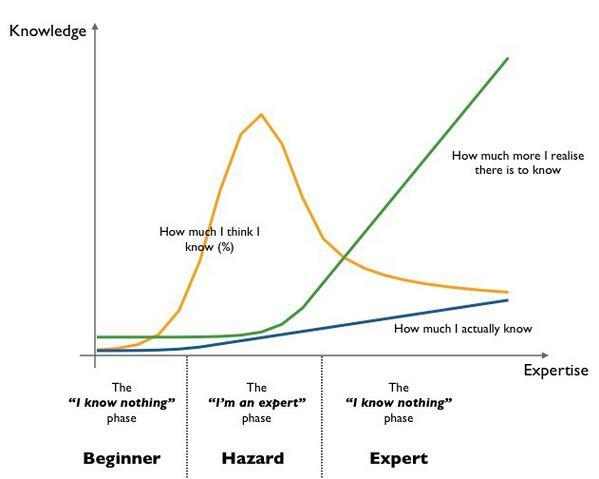 Or why it is important to build up a competency to understand risk. Let me try to distill what I understand about risk, when it comes to building wealth in general. This applies to whether it is property, stocks and bonds, business building. In general, if your wealth machine requires you to prospect them, and think about uncertainty, this is a good piece to read. When you talk to your insurance agents or financial planners, they often tell you that, to earn high returns, you need to take more risk. They are not exactly correct. What they meant to say is that, you HOPE that by taking on more risk, you HOPE the reward at the end of the tunnel is greater. The reward at the end is by no means a given. It doesn’t mean that when you buy stocks, after 10 years, your return from stocks is a definite 8%/yr compounded. It might vary from -4%/yr to 12%/yr for example. Risk is a Deviation from an Outcome. There can be positive risk or negative risk. If you manage a project there is negative risk such as the raw materials that your construction is based on cost a whole lot more. But it could also cost a whole lot less, which is good for you. Is this what you were expecting? They deviate from your original outcome. 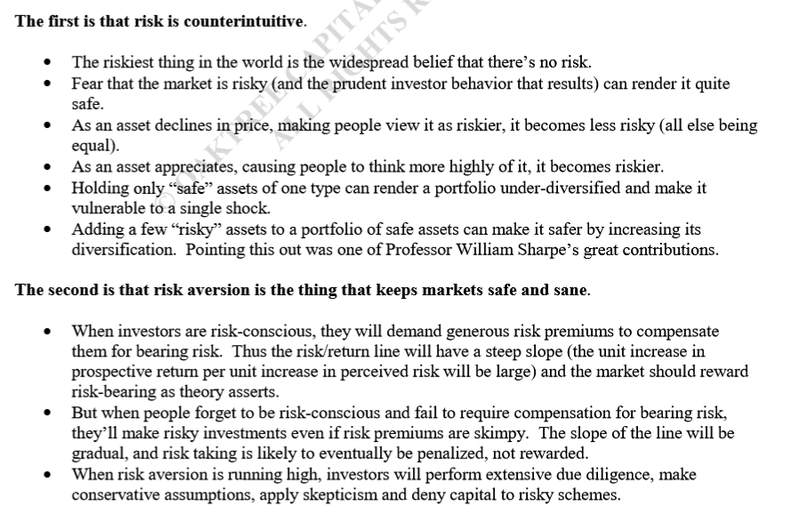 Howard Marks, Oaktree Capital Chairman writes a great newsletter on how we should look at risk. I will be lifting various portions from the news letter. Mr Marks have probably the best illustration for return and risk. We tend to look at risk and return as a straight line. More risk, higher return. Less risk, lower return. We should visualize how we look at risk and return like this illustration here. To explain, every point on the line in the illustration is a normal distribution. A normal distribution is how the returns of a sample of people taking the SAME level of risk gets. A normal distribution means that majority of the people taking the same risk will fall in the middle (the fat part of the normal distribution) and the minority will fall into the tail end. This means that majority of those taking the same level of risk will earn an average reward, but there are the minority that will earn much better than average, although they took the same risk, and there will be minority that will lose badly, despite taking the same risk. When your risk is low, the normal distribution shows that your returns might vary, but they tend to be always positive. You either get a little bit more or less, but you won’t lose money. However, when your risk increases, the distribution of that risk point is much wider. This means that the range of outcomes for that risk point span a larger normal distribution. Starting from the third fan distribution, if you count from the left, the range of outcomes can be very good or very mediocre, but still positive. That changes when you look at the forth fan. In some low probabilities, your long term return can be negative, which means that you risk capital loss. Or that you could shoot to them moon, in some low probabilities! This is what your financial planner, or investment manager will sell you. A consistent wealth growth rate of 6-9%/year, compounding your wealth over time. This is also what financial bloggers like myself sells you to make it simple for your understanding. However, usually the reality is like the illustration above. The prices go up and down. They don’t go straight up. In this sequence there are -22%, -49%,-30% declines but they are also 115%, 49%, 87% rises. At certain times, the prices deviate from the mean line, if you draw one line up. Different Wealth Machines, may have different volatility. 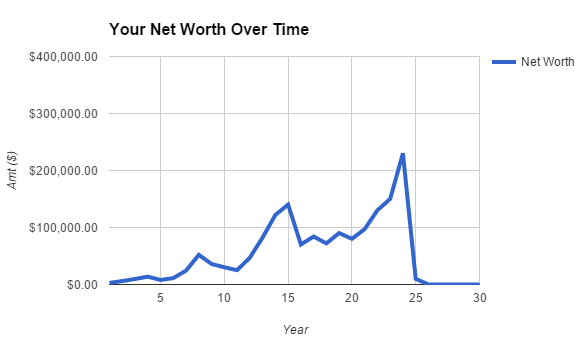 Notice this: In this net worth chart, your net worth ends up the same place as the smooth chart you see previously. The outcome is the same. Volatility is not risk. If the outcome of our net worth eventually ends up where we THINK we will get to, then there is no risk. Both #1 and #2 may refer to the same thing. This is similar to the 2 charts before. 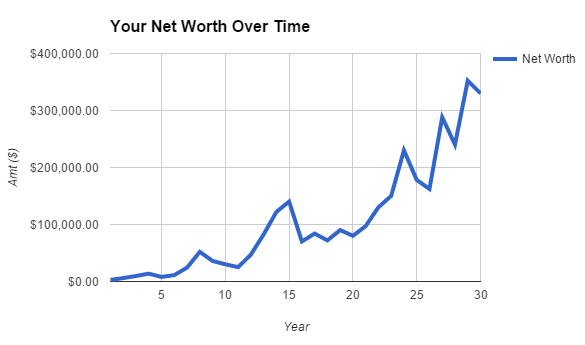 The only difference is that at year 24, the wealth asset value went to $10,000, then to less than that. This is a permanent loss of capital. This one looks similar to the one above, but this is not so bad. 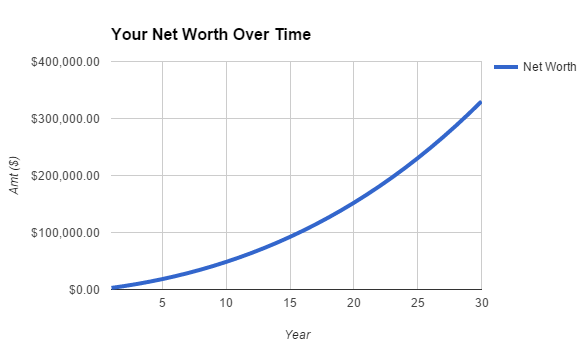 Essentially your net worth loss so much that, even though its not zero, and there is every chance that you can cling on a slight hope for recovery, the hope is very small. 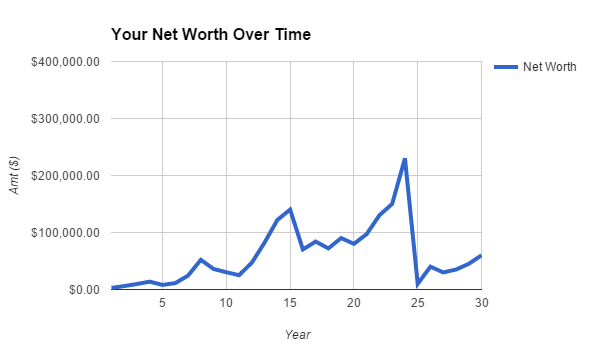 Your net worth is a much smaller percentage of your capital that it will be tough to recover back. This is permanent impairment of capital. Ezra is in the oil and gas sector. While much of its recent woes can be due to the cyclical nature of the sector, purchasing the stock at the wrong valuation would possibly lead to large unrealized capital losses. Due to the cyclical nature, the stock would recovery, but the duration to wait till recovery could be very long, the business nature may have changed, such that, the Ezra might not go back to your original entry price. Much opportunity costs are incurred while waiting. 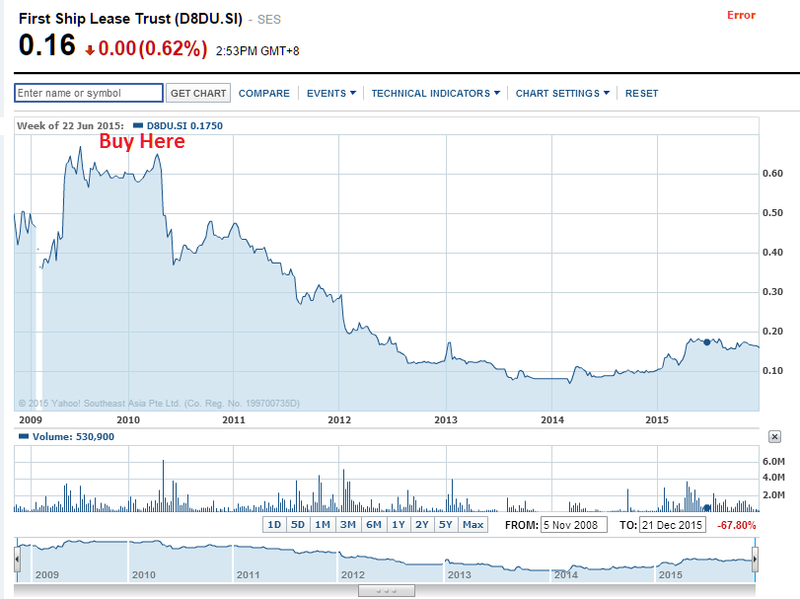 Business Trust FSL Trust have been undergoing some revival from $0.10 to $0.17 cents. For the old investors, it has been a stock to forget if you purchase it at $0.60. Even with a more than 50% rise in recent times, the price is still a far cry from 2010 prices. Prospecting individual stocks can be challenging, and while you can take the volatility, you may have failed to mitigate the negative outcome. What good is a stock that goes up and down, up and down only for it to end up being much lower with not much hope of getting out with your capital intact? This doesn’t only happen to stocks. 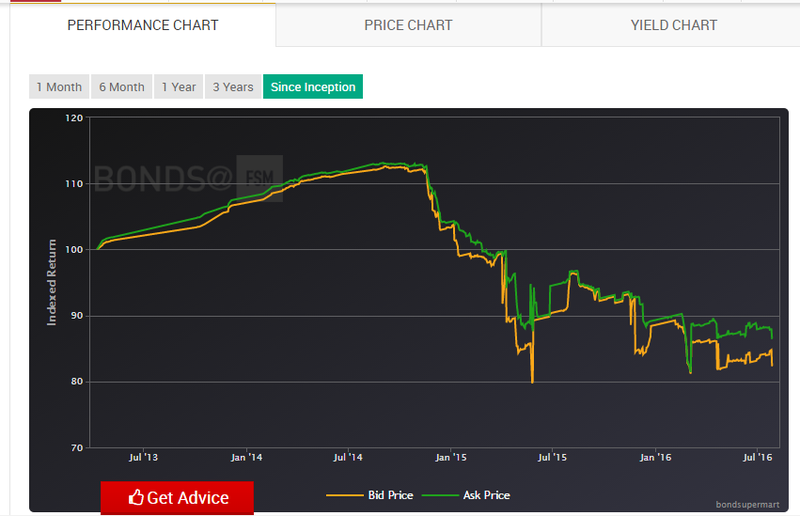 The above shows the price performance chart of a corporate bond of Swiber, a oil and gas company that was unable to pay the interest and principal of the money they lend to shareholders. I hope I convinced you that volatility and risk are different. What are the kind of wealth building risks? We can go on all day about what are the kind of risks, but for a good list, check out the list of risks that Howard Marks provides at the end of this article. How Can we Manage Risks or Negative Outcomes in Building Wealth? The first thing is to have an awareness that risks is a big deal in wealth building and that you need to pay attention to it. Each form of wealth machine will have a set of general risks characteristics that applies to all wealth machines and also a set of risks that is pertaining to your particular type of wealth building. To sleep soundly at night, you need to first identify the risks in your investments well. You need to also find out the probability they do happen and its impact on your investment. To do that, you need to gain knowledge and wisdom about how to determine the risks in your wealth machine. Then you can assess the impact to your assets, and to your investments. In the case where there is a earnings impact or balance sheet impact risk, assess what is the dollar value and how that affects the price you would pay for the property, listed business (stocks), exchange traded fund. With this you can analyse in terms of the standard risk management actions. When it comes to awareness of risks, be sure to use the following matrix as a guidepost of what you know and what you don’t know. No matter how competent we are in our form of wealth building, there are areas that we have no control over, or that we are not competent enough to be aware. Failure to understand this matrix would make you think that once you have this level of competency, you know almost everything and nothing will go wrong. In wealth building, you never master everything. After a while you realize you don’t know a lot and you have to constantly build competency. 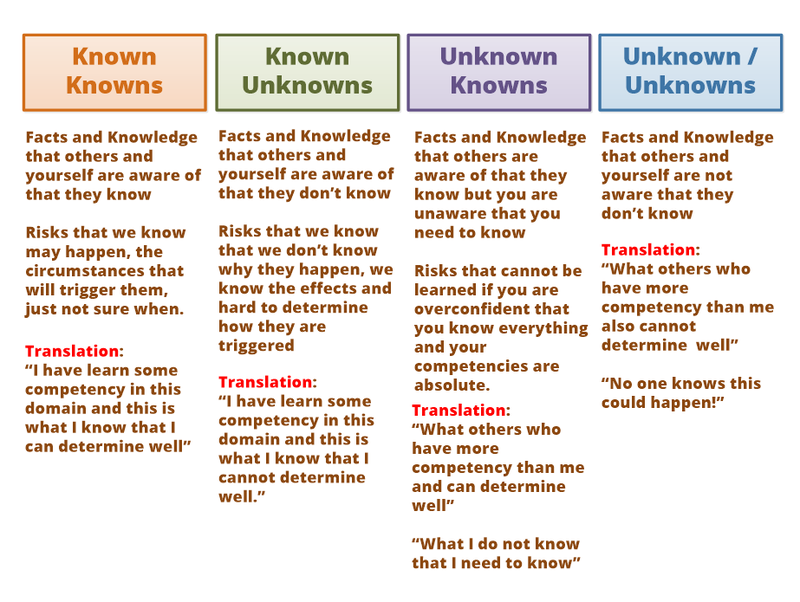 Known Knowns and Known Unknowns are what we strive to be able to figure out when we improve our competency. With Known Knowns, you will be able to come up with the right risk responses (avoid, mitigate, transfer or accept) and let us know roughly how much we may stand to lose or gain. Known Unknowns are what we know we will not be within our control. As such we may want to take a hard look whether there are risk mitigation and transfers that can be carried out or we need to accept these risks. The danger for most people are the Unkown Knowns. This is what I termed the knowledge gap, what you need to know to be competent to risk manage your wealth machine well but you are not aware that you don’t know. Unfortunately there is not much you can do but have a good system to continuously work on increasing your competency. What is of utmost importance is to not overpay for more than its intrinsic value. If you do not like to pay $2500 for an IPAD that is worth $700, why would you be willing to do that on a potential asset that is worth 5 to 20 times that amount? In the section on impairment to capital, we have seen that if you do not value these wealth assets well, you end up buying assets that is worth only a small amount compare to what you originally pay for. Your question would be: How do I know how to value bonds, preference shares, stocks , properties better? By increasing your competency so that you get better at it. This sounds like a high level answer which it is but the way to value each can be rather different. If you would like to read some of my resources on fundamental valuation of wealth assets or stocks. A lot of the times, we get our valuations wrong (we think its worth $1 but essentially its only worth $0.75) is because we lack the competency to see more risky outcomes and thus we value them too highly. Why do people always say its better to buy during a bear market? I interpret it in a very different manner. Bear Market is when all the unknown knowns, and unknown unknowns surfaced. You see the ugly stuff you previously failed to see. When the ugly stuff is brought out, you can then use your competence to assess what is the right price to pay for the assets. He means that risk and safety should be view inversely. When things are looking good during a bull market, that is where people discount away the risky outcomes, that they would not happen. Conversely, when in the bear market, the companies that was looking sound, may show that they really can swim when everyone is sinking, and those that cannot, will show they really manage credit risk, liquidity risk, business risk very badly. You can then assess if the problem is fixable. When the water level falls, that is where you see who is the naked ones, and then you know which ship is the safest and the better assets. To build on the importance of valuation, when we look at the potential return of prospective wealth assets such as stocks, business, property, bonds we would like to purchase, factor in risk. When you look at a real estate investment trust (REIT) that give you a dividend yield 10%, you will think its a good enough return for you. 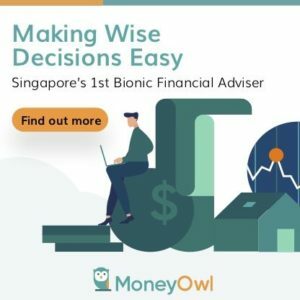 These risky outcomes will give you a range of valuations, and there are some things that are known unknowns and then there are some things that are unknown knowns, due to your limitation in competency. Returns per unit risk affects on how nimble or how long you can hold on to assets. If you realize you have too much unknown knowns for this wealth asset, you either risk management by avoid buying, or that be more vigilant and mitigate by selling first and asking questions later. How can you hold an asset longer? When you have build conviction. Conviction is done when you have a certain degree of confidence you have uncovered enough risks, value well thinking with these risks in mind and that you have a good margin of safety, and the potential reward is good. In other words a good return per unit risk. After going through such an ordeal, I realize that I don’t have a stomach for it. We know its going to come sooner or later. The key is that I hope i have a fundamentally sound plan for it. I hope that being through it once could help me better equipped for it. System: When prospecting business, always evaluate the scenario’s in whether a business can survive in a challenging recession. A 2009 case study for the business is a good litmus test. System: Market drawdowns is unpredictable and my plan is not to predict them, but have a fundamentally sound plan for different frequency of draw downs. Read here and here. System: How strong you will hold on to your holdings depends a lot on your understanding of your plan, your understanding of your holdings ability to do well in that scenario. Understand the kind of goose you are holding. Sell the goose you felt you don’t know well, or the goose you know won’t survive such a scenario. It is not an exhaustive list but what I can recall from my head now. The plan is probably more important than the individual businesses. And i remove a lot of naive if this happen then do that because they are likely not going to work. Number 6 and 7 is what I been working hard on. It is something many think they have mastered. Not me. I removed all the TA stuff with the moving averages from this plan because this 4-5 years taught me its rather futile. It might work for you. Not me. No matter how much knowledge you can gather from readings is of no use. If you can’t read your “inner self”. So try read yourself first. thanks for sharing. i guess its the same. more reflecting and understand there will always be a next opportunity and not being afraid to make every decision. Point 2 will most likely result in very little investment to be made especially when we are in a bull market. Point 1 and 3 will not be accurate as time goes along. Financial conditions of companies are changing all the time, especially in an uptrend. When the market realizes it, point 2 has long passed. Again, few investment opportunities, though probably safer. Then the question will be: staying cash will always be safe, but who wants to stay in cash forever? hi freedom, thanks for that. if point 2 results in lesser opportunities but surer ones so be it. I only put money into company that I am confident with, company with product strongly demanded such that the income stream is strong and continuing. I tend to stay with them even they are down a lot, provided fundamentals still looks right. That’s very strong conviction but how do you evaluate real problems with your investments.